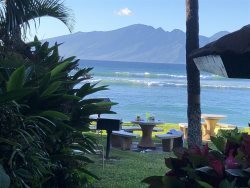 Thank you for your interest in Maui vacation rental accommodations with BEACH RENTALS WEST MAUI. We are pleased to offer to our guests prior to arrival, our complimentary activity planning and concierge assistance as an added service. If you need help with dining reservations, private chef service, golf tee times, a session with a family photographer or ticketing for the fun activities and tours such as helicopters, luaus, snorkeling and more, please contact your private concierge Karen Danaher to set this up prior to your arrival. Our concierge Karen Danaher will be happy to assist you with your activity and tour bookings, dining reservations, golf tee times, spa appointments, and any other special requests you may have. Karen has been working as a concierge for 18 years and is well-versed in all things Maui. She is also very knowledgeable about the outer islands so if your travel plans include a visit to Oahu, Kauai, or Hawaii, please let her know. Karen can be reached at 808 283-6661 or [email protected]. You may also visit her activity website by clicking here. Tour reservations can and do sell out in advance so we recommend booking early. Please let Karen know if you are thinking about anything special during your stay and she will be happy to provide you with rates and details.